The Holy Great Martyr Demetrius was the son of a Roman proconsul in Thessalonica. Three centuries had then already elapsed, and Roman paganism, spiritually shattered and defeated by the multitude of martyrs and confessors of the Crucified Saviour, intensified its persecutions. Both the father and mother of saint Demetrius were clandestine Christians. In a secret house-church at the home of the proconsul, the child was baptised and raised in the Christian faith. When the father died, and the child had reached the age of maturity, the emperor Galerius Maximian – having ascended the throne in the year 305 – summoned him, and confident in his education and military administrative abilities, appointed him to the position of his father as proconsul of the Thessalonica district. The chief task expected of this young commander consisted in the defence of the city from barbarians, and in the extermination of Christianity. In regard to Christians the will of the emperor was expressed simply: “Put to death anyone who calls on the name of the Crucified.” The emperor did not suspect in appointing Demetrius, how wide a swath of confessors acts he had opened up for the clandestine ascetic. Accepting the appointment, Demetrius returned to Thessalonica and in front of everyone immediately confessed and glorified our Lord Jesus Christ. Instead of persecuting and executing Christians, he openly began to teach the inhabitants of the city the Christian faith and to extirpate pagan customs and idol-worship. The compiler of his life, Metaphrastes, says that in his teaching zeal he became for Thessalonica “a second Apostle Paul,” particularly since “the Apostle to the Gentiles” once founded at this city the first community of believers. The Lord also destined Saint Demetrius to follow the holy Apostle Paul to a death by martyrdom. When Maximian learned that the proconsul newly appointed by him was a Christian, and that he had converted to Christianity many Roman subjects who were influenced by his example, the rage of the emperor know no bounds. Returning from a campaign in the Black Sea region, the emperor decided to lead his army through Thessalonica, filled with the desire to make a massacre of the Soluneia Christians. Learning of this, Saint Demetrius opportunely ordered his faithful servant Luppos to distribute his wealth to the poor with the words: “Give away the earthly riches amongst them, for we shalt seek for ourselves heavenly riches.” And he gave himself over to prayer and fasting, preparing himself for the accepting of a martyr’s crown. When the emperor came into the city, he summoned Demetrius, who boldly confessed himself a Christian and denounced the falsehood and futility of Roman polytheism. Maximian gave orders to lock up the confessor in prison, and an Angel came to him in confinement, comforting and encouraging him for the act. The emperor meanwhile concerned himself with a foul gladiators spectacle, esteeming as his beloved champion a German by the name of Leo, who made a challenge for a Christian to struggle with him on the platform over the spears of the victorious soldiers. A brave youth from the Soluneia Christians, Nestor by name, went to the prison to his advisor Demetrius and requested to be given the blessing for single combat with the barbarian. With the blessing of Demetrius and through his prayers, Nestor prevailed over the fierce German and hurled him from the daïs onto the spears of the soldiers, just as the murderous pagan would have done with the Christian. 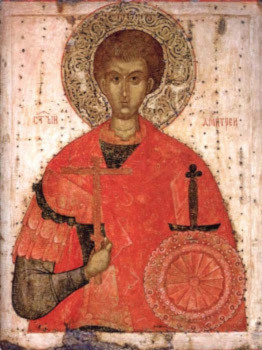 The enraged commander gave orders to immediately execute the holy Martyr Nestor and dispatched a guard to the prison to run through with spears the one who had blessed this deed, Saint Demetrius. At dawn on 26 October 306 soldiers appeared in the underground prison of the holy saint and ran him through with spears. His faithful servant, Saint Luppos, gathered up on a towel the blood of Saint Demetrius, and he took from his finger the imperial ring, a symbol of his high status, and likewise dipped it also in the blood. With the ring and other holy things sanctified by the blood of Saint Demetrius, Saint Luppos began to heal the infirm. The emperor gave orders to arrest and kill him. The body of the holy Great Martyr Demetrius was cast out for devouring by wild animals, but the Soluneia Christians took it and secretly committed it to earth. During the reign of holy Equal-to-the-Apostles Constantine (306-337), a church was erected over the grave of Saint Demetrius. An hundred years later, during the construction of a majestic new church on the old spot, the incorrupt relics of the holy martyr were uncovered. From the time of the seventh century beneath the crypt of the Great Martyr Demetrius was found a miraculous flowing of fragrant myrrh, in regard to which the Great Martyr Demetrius receives the church title “Myrrh-flowing.” Several times those venerating the Soluneia wonderworker made attempts at a transfer of his holy relics, or part of them, to Constantinople. But invariably Saint Demetrius secretly made apparent his will to remain the protector and defender of the people of Thessalonica.